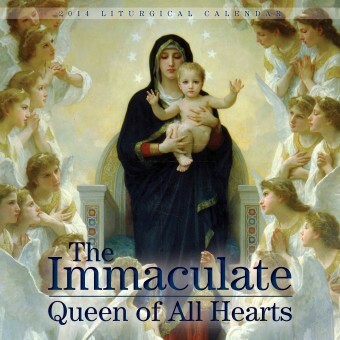 2014 Calendar: "The Immaculate, Queen of All Hearts"
2014 Liturgical Calendar: "The Immaculate, Queen of All Hearts"
A collection of colorful pictures honoring Our Lady with titles from the Litany of Loreto. 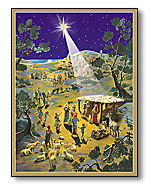 In addition to beautiful Marian poems in the front cover, our complete liturgical calendar includes the class and liturgical color of each day of the year according to the 1962 Roman Missal, as well as current disciplinary law and recommended tranditional discipline for all days of fast and abstinence. Old World style imported from Germany! 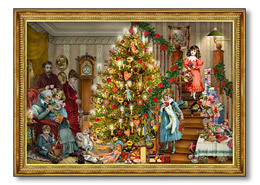 Each calendar has twenty-four little doors (one for each day of December before Christmas). For example, on December 12, you open the door with the "12" on it to reveal a charming little picture and a Scripture verse (on the back of the door) related to the coming of the Messiah. 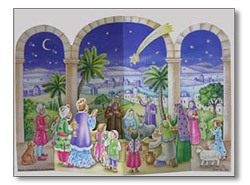 The pictures behind the doors are on translucent paper so when held to the light (ideally you would tape the calendar to a window), the image is illuminated. Calendars are richly decorated and adorned with glitter. Calendars are reusable year after year. A wonderful Advent tradition. Children LOVE these calendars! 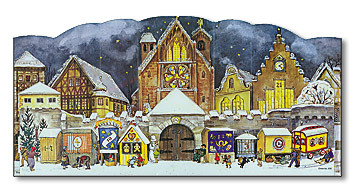 This Calendar was first published in 1947 - one of the first Advent Calendars after World War II - one of the most successful item at that time. Old World style imported from Germany! Each calendar has 24 little doors (one for each day of December before Christmas). For example, on December 12, you open the door with the 12 on it to reveal a charming little picture and a Scripture verse (on the back of the door) related to the coming of the Messiah. 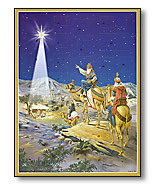 The pictures behind the doors are on translucent paper so when held to the light (ideally you would tape the calendar to a window), the image is illuminated. Calendars are richly decorated and adorned with glitter. Calendars are reusable year after year. A wonderful Advent tradition. Children LOVE these calendars!